Noahpinion: Jim Bullard chucks the Solow growth model! Jim Bullard chucks the Solow growth model! Sometimes I skim stuff too fast. When I saw David Andolfatto and Tyler Cowen linking to a Jim Bullard speech about wealth effects and output, I assumed that it was some sort of observation about aggregate demand. After all, wealth affects aggregate demand, so when wealth evaporates in a financial crisis, AD should fall. No surprise there. But then, via Scott Sumner, I found out that Bullard (the president of the Federal Reserve Bank of St. Louis) is saying that wealth shocks affect long run aggregate supply! Intuitively, this makes absolutely zero sense. Permanent negative wealth shocks lower potential output? Well, if capital is destroyed, that's true; for example, take the effect of World War 2 on Japan and Europe. All those bombs certainly lowered productive capacity (while destroying wealth). But if the financial crisis was that sort of thing, then it should raise the trend rate of growth, as we engage in "catch-up growth" to replace the destroyed capital. Are we seeing rapid catch-up growth now? No. The negative wealth shock lowers consumption and output. But after the recession ends, the economy simply grows from that point at an ordinary rate, neither faster nor slower than in ordinary times. It is more like an earthquake which has left one part of the land higher than another part. There is no expectation of a “bounce back” to a higher level of output after the recession ends. Huh. I just can't make heads or tails of this idea. It seems to fly in the face of all the most basic intuition macroeconomists possess regarding growth. Issue #1: A decline in housing prices is not a decline in the stock of productive capital. Houses are mostly consumer durables. A fall in housing prices leaves us with the same number of actual houses as before the crash; yes, that will have supply effects via geographic clustering and relocation costs, but there's no reason to think that these effects are dominating what we see in the economy. Why does a decline in housing prices leave our economy able to produce less than before? It doesn't seem like it should. Issue #2: A permanent negative shock to the stock of productive capital, as I mentioned earlier, will lower potential output, but will raise the rate of growth due to the renewed possibility of "catch-up" as we build back up to our old capital/labor ratio. Think of Japan after World War 2. In other words, there should be a "bounce back," directly counter to what Bullard is saying. That is not "crazy talk," necessarily, because it is at least conceivable that the Solow model - and hence, most growth theorists working today - might be completely wrong. But Bullard is going to have a hard time convincing the profession of that. And note that Bullard's contention would also invalidate all business cycle models of the "RBC" type, since those models are based on the neoclassical growth model. Even more deeply, what Bullard is saying is directly counter to our most basic notions of what "capital" is. For more Bullard critiques, see Scott Sumner and Matt Yglesias, who have already made some of these points. Bottom line: "We're not as wealthy as we thought we were, and hence we are choosing to buy less stuff" is an argument about aggregate demand, and it is an argument that many people accept. However, "We're not as wealthy as we thought we were, and hence we are able to produce less stuff" makes no sense in the context of any economic theory I know of. Bullard has some serious explaining to do if he wants us to believe the latter. Actually the idea that prolonged shocks to AD affect long-run AS is not new nor radical. The so-called hysteresis theory of unemployment was put forth by Blanchard and Summers in a 1986 and is discussed in many intermediate macro textbooks (e.g., Mankiw). Ball (2009) finds empirical support for the theory (both are NBER papers). It seems to me that this is what Bullard had in mind. Hmm. Perhaps slow down a bit more? I would read "This has lowered consumption and output" as "this has lowered demand and therefore supply". In essence he is saying that the economy ejected several million consumer-workers in a single spasm, and then continued growing from that point. This observation has been made before from looking at the stats, on Econbrowser I think. An argument about L, not K.
I actually see this as potentially Paleo-Keyensian; that asset price busts dent 'animal spirits' which impairs capital formation. This is really not all that different from what Krugman has been saying in that permanent unemployment impairs human capital with longer-term ramifications, and it seems to me there is some truth to both contentions. I would argue of course that the real problem lies in the misallocation of capital in the Keynesian casino is the problem of the first order, and that there is a lot of truth to Schumpeter's insight that the business cycle is the beating heart of capitalism, but somewhere in and around both it seems to me there is room for this one as well. Which brings us back to the fallacy of 'rational expectations'. How is it possible to be rational when there is no rational basis on which to make such decisions, and we're forced to fall back on what economists in their infinite wisdom have deemed irrational? But I digress. Point being that investment busts can have implications for investment demand that in a world of pump priming of other sectors in the economy can theoretically be meaningful for long-term growth even as it is less so in the short-term. I agree with Greg. I think you engaged in an overfine reading of Bullard's comments. Noah is correct in the characterization of housing as a consumer durable and hence the bubbled value thereof as paper wealth and not accessible capital for real growth. The proof of this derives from looking at what actually happened. While the explosion in housing values unquestionably fueled AD (and AS) during the bubble, it required the highly unsupportable transmission mechanism of willy-nilly credit issuance (disconnected from borrowers flows of income to support same, and resulting in a vicious feedback loop) to create those paper values. This was neither real, nor can it be considered creation of productive capital. It was merely a conduit for drawing on indebtedness that - when all was said and done - mostly remains (and is mostly unresolved) as the asset values plummeted. The correct interpretation, in my opinion, is to therefore look not to the the destruction of paper homeowner equity, but to the destruction of the capital of lenders. Although substantially unrecognized to date, it is nevertheless quite destroyed and is the "goo" in the system that stands in the way of a resumption of growth. The ultimate holders of capital available to channel to investment are conserving same to offset capital they are aware has been destroyed even though that destruction has not been formally recognized. This is compounded by the undenialble downward trending effects on pricing that results from a global glut of labor resources, productive capacity AND CAPITAL relative to global AD, which leads the holder of capital in the developed nations to conclude that new investment is unwise if such investment is dependent on current price points and/or asset values derived from economic rents that are in turn dependent of price and wage levels. So that leaves a supply glut and debt deflation - which brings everything to a grinding halt because there are no good answers OTHER THAN recognizing the real levels of capital destruction (and dealing with the attendent impact on the banking system and markets) repricing and starting over to save and rebuild capital. An unpopular alternative in some circles, I think you'd all agree. Perhaps he's trying to have the benefits of a demand shock in his model, without committing the heresy of acknowledging a shortfall in demand. Marjorajam, I think, is on the right track. A "wealth shock" occurs because the views embedded in asset prices turned out to be wrong -- by definition. This could occur as a simple decline in the expected value of income (the mean). Or, the wealth shock could be also be caused by a one-time adjustment in the uncertainty of income forecasts (the std. deviation). Even worse, the probability distribution could not only "spread", but also fatten at the negative tail -- to account for "unknown unknowns". This would depress business investment, new firm creation, and the intensity of financial intermediation. Legacy capital mis-allocation would make the problem worse. These are all AS issues. One could redefine "bubble" as, "a transitory period of heightened certainty in future (real) income forecasts". "The correct interpretation, in my opinion, is to therefore look not to the the destruction of paper homeowner equity, but to the destruction of the capital of lenders. Although substantially unrecognized to date, it is nevertheless quite destroyed and is the "goo" in the system that stands in the way of a resumption of growth." It most certainly is not. Banks are recapitalized and not lending as much as they could because they don't see good lending opportunities. Do you see any bargains out there in terms of high return places to put your money? I agree that housing is not productive capital, but there is no reason to spend more and more on capital if there is not proportionally more and more being spent on the product of that capital. At some point you start scraping the bottom of the investment barrel and directing more money to capital becomes a ponzi scheme. "there are no good answers OTHER THAN [...] starting over to save"
Depends on who you're saying needs to save. The middle class needs to save more and rely on debt less. The economy as a whole does not need more savings; banks have been encouraging the middle class to go into debt precisely because there is plenty of savings. To say that we need more savings is to say there are more loans that should be made but aren't being made, and that isn't the problem we're having. What confuses people is that savings and debt are opposites to an individual, but they are essentially the same thing at a macro level, so the solution to the problem of "too much debt" is not "more saving," that's actually an anti-solution that puts pressure on Wall Street to search the hills and valleys for anyone else who could be going into more debt. 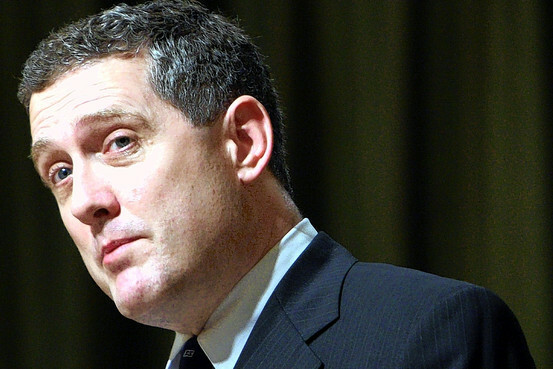 "Bullard is fishing for reasons to raise rates. Elsewhere he argues that low rates hurts savers." Agreed. People think the Fed sets interest rates (which they do try to influence). They also think the Fed controls inflation (which they try to influence.) What they can actually do is trade one for the other. When both are low, don't look to them for the solution; you're confronting a structural problem. Our low interest rates are bad because they are an indicator of structural problems, but creating deflation and putting debtors further underwater to reward savers is not the solution to our problems. Thanks. So I guess that chucking the Solow growth model is not so taboo! But in any case, I find the idea of unit root supply-side shocks to output difficult to swallow, since we have so many real examples of capital stock being destroyed (wars), and conditional convergence still seems to hold. That makes the Shimer model look very counterfactual. Well, I don't think that Shimer literally thinks that the physical capital evaporated. But the same thing would happen if the efficiency of that capital in producing services of value was suddenly diminished. In any case, I just thought you might find it interesting. More important: Keep an eye out on my follow up post regarding this issue; I would be interested on your take. Regards. Perhaps I was a bit terse in my earlier comment. Here's my reading of Bullard. The bursting of the housing bubble decreased wealth and shocked the economy. The effects of the shock were concentrated among certain groups. One part of the land was thrown down into the swamp of long-term unemployment (in part due to losing their wealth), and (for reasons not given) there is no expectation that this part of the land will rise up to its former height. Let's try this: in David Andolfatto's comment we replace physical capital with human capital. Let's say that technological change over long periods of time shifts the distribution of "worker level of human capital" - or "skills", if you prefer - required for balanced growth to the right, and (possibly) changes its shape. Here I have in mind mainly general skills, not the industry-specific ones that DeLong, Krugman and others seem to focus on. Literacy and numeracy, interpersonal skills, self organisation and self-control, problem solving, adaptability and compliance. Those sorts of things. A bubble is unbalanced growth, so the actual human capital (of this sort) of those employed may 'stick' leftwards of the balanced-growth distribution for the duration of the bubble. When the bubble bursts there will be reversion to the balanced growth path. The balanced growth path, now revealed, requires different proportions of the various kinds of general human capital. The unemployed have the bits that don't fit inside the curve, or in losing their homes and jobs lost capital that is now needed in order to fit inside it, such as a good credit score (which betokens self-organisation) and a clean arrest sheet (which betokens compliance). Yes, perhaps this is the structural argument dressed up in peculiar language. But the structure of the economy does change in the long run, where Solow's model is relevant. And it would be surprising if the actual distribution of human capital was that required for balanced growth at every point in time. Of course Bullard didn't say any of this - I'm reading too much into a lullaby aimed at institutional investors through thought leaders, an expectation management and position protection exercise. While Bullard is only engaged in a position protecting exercise, there is a persistent error expressed by several comments above, like Dan who writes, "Noah is correct in the characterization of housing as a consumer durable and hence the bubbled value thereof as paper wealth and not accessible capital for real growth." The "bubble" was extremely important to community and regional bank small business lending. Large home equity real estate values permitted massive amounts of bank lending for commercial purposes, using seconds. Banks, today, are not making these loans, as the value of this collateral is still declining. Noah tends to make this mistake from time to time. Banks, lend, not on their reserves but upon the value of collateral. "Bottom line: "We're not as wealthy as we thought we were, and hence we are choosing to buy less stuff" is an argument about aggregate demand, and it is an argument that many people accept. However, "We're not as wealthy as we thought we were, and hence we are able to produce less stuff" makes no sense in the context of any economic theory I know of. Bullard has some serious explaining to do if he wants us to believe the latter." I don't think people spent more during the housing bubble because they thought they were wealthier. They WERE wealthier in the judgment of the banks who gave people home equity loans. When everyone thought home prices could only go up that was the way to go. Now that we have the reverse I don't think they make those kind of loans any more. I wonder if you subtracted from GDP the imputed value of owner occupied housing if savings actually went negative during that time. That pattern of consumer spending is clearly not sustainable. Also, are the underwater mortgages of today all from people who bought in the bubble era, or also people with some pretty large home equity loans that they now have to pay off. Anyway, I agree with Bullard that this will have a depressing effect on AD for the near future at least, and the levels of GDP in those years will have to be disregarded in terms of trend analysis. If you say that AD has to come before AS, then yes, AS will be depressed also.